The realism of today’s 3D blockbusters can blow audiences away. 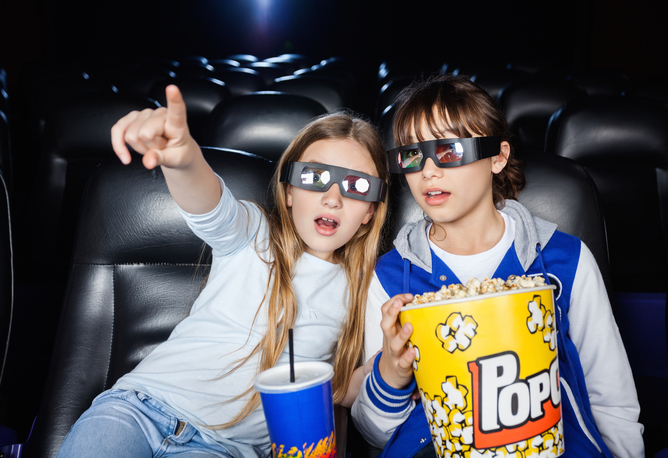 By using 3D glasses to present different images to the two eyes, stereoscopic 3D technology fools the brain into believing it is viewing a real scene rather than a flat image on a screen. Now 3D televisions enable viewers to experience the effect at home as well. Yet 3D has not become as popular as some might have hoped. 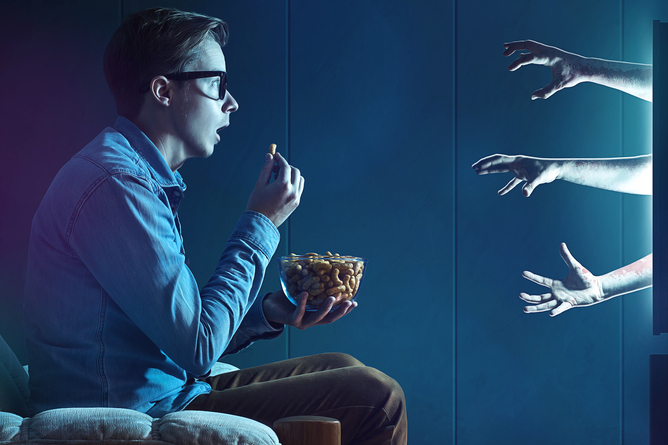 Many people say watching 3D gives them unpleasant side-effects such as headache or nausea. Scientists don’t fully understand why this is. It’s true that badly made 3D effects can cause discomfort. However, makers of 3D content are well aware of the possible issues and work hard to avoid them. A more fundamental problem may be conflict between different senses. When we watch a film such as Avatar, our visual system may tell us that we are wheeling high in the skies of a distant moon, but other senses tell us that we are sitting motionless in a chair. Of course, 2D films present this kind of conflict as well, but our brains may simply be more used to accepting that 2D content is not “real”. Some people have suggested that 3D content may cause more serious side effects. For example, Samsung’s safety leaflet links its 3D TV set to a vast range of possible symptoms – not only headache, fatigue, motion sickness and eye strain, but also decreased postural stability, altered vision, dizziness, cramps, convulsions and even loss of awareness. Clearly if 3D TV has such effects, there are important safety implications. But to date, very little work has been done to assess this. We recently invited 433 volunteers, aged from 4 to 82 years, into my lab to watch the film Toy Story on either a 2D or 3D TV. We used two common types of 3D TV, known as “active” and “passive”. Participants carried out a battery of tests designed to assess their balance and coordination, both before and after viewing. They wore two triaxial accelerometers – small devices to record their body movements – as they walked around a simple obstacle course. To assess eye-hand coordination, participants played a “buzz the wire” game, guiding a hoop along a convoluted wire track without allowing the two to come into contact. We argued that, if viewing 3D made participants dizzy, they would take longer to complete the obstacle course, and/or the accelerometers would show that their body movements were less stable. If it affected their vision, they would take longer to complete the “buzz the wire” game, and/or make more mistakes. 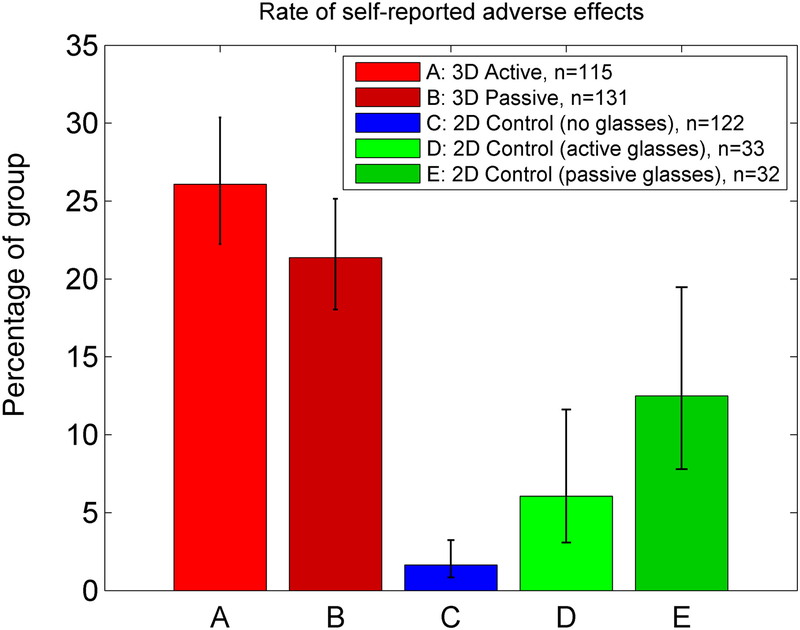 Some people have suggested that adverse effects with 3D reflect underlying visual problems. So we also had our volunteers’ vision thoroughly assessed by eye care professionals before they visited the lab. Of course, Holly’s nausea had nothing to do with the 1kg of popcorn she’d just eaten. On our objective tests of balance and coordination, we couldn’t detect any effects of 3D at all. Not surprisingly, people tended to perform a little better the second time round. But it didn’t seem to matter whether they had watched the film in 2D or 3D, or whether the 3D was active or passive. We also couldn’t find any links between age or eyesight and whether people were affected by 3D. We did find that people who had viewed the 3D movie reported that the depth was more realistic. They also reported more adverse effects, mainly headache and eye strain, but also including dizziness or nausea. However, it’s not clear that the dizziness was really due to 3D. Craftily, we gave some of our volunteers 3D glasses, making them think they were viewing in 3D, but showed them the film in 2D. These people reported dizziness at about the same rate (3%) as those viewing real 3D. In contrast, people viewing real 3D were much more likely to report headache or eyestrain (around 10%) than people who just thought they were viewing 3D. This suggests that while 3D gives some people a headache, it doesn’t really make people dizzy – people just expect it to. Of course, it’s possible that 3D caused an impairment that was so subtle or transient that our tests failed to detect it. On the other hand, that also implies less cause for concern in everyday life. We also tested only one 3D film, choosing Toy Story as something fun and engaging for all age-groups. Even if computer-generated 3D from the experts at Pixar doesn’t cause dizziness, it remains possible that less carefully-controlled 3D content – say, live-action football – could do so. Nevertheless, given the lack of previous work in this area, our study provides welcome reassurance. Can 3D effects give you a headache? Yes, for some people. Can they make you dizzy? Probably not. Do they make Toy Story more exciting? That depends who’s watching. Jenny Read is Reader in vision science at Newcastle University.